Casey Elliott, son of master engine builder Ernie Elliott, set his sights on becoming a second generation driver within the famed Elliott family. Born February 13, 1974, Casey grew up around race cars and the sounds of engines being tested and tweaked. It was the same year the family left the Georgia short tracks to try their luck in NASCAR’s premier Winston Cup series. Four days after his eleventh birthday in 1985, his father and his uncles Bill and Dan won the first of two Daytona 500s with Melling Racing in the famed No. 9 Ford Thunderbirds. Throughout his childhood, Casey thought of nothing but driving race cars and carrying on the family legacy. Then in 1990, Casey realized his dream by driving at Lanier Raceway in Gainesville, Ga., battling such stars as Jody Ridley, Jeff Purvis, Rick Crawford, and Jason Keller in NASCAR’s All Pro Series. Then on June 20, 1992, he showed great promise by winning the pole and led 171 of the 200 laps there before finishing second. During the 1992 and ’93 Winston Southeast Pro Series seasons, Casey entered 22 events with a career best fifth-place finish at Lanier. He also entered two Xfinity Series events in Fords fielded by his uncle Bill in 1993, qualifying in the top-10 for both races. He finished 20th in his debut at Michigan and 44th at Charlotte after being swept into an accident. Casey was set to compete full-time in NASCAR’s Busch Grand National Series in 1994. While his cars were being built in December of 1993, a medical examination revealed a cancerous growth on his upper right thigh. Surgery followed and tests showed it had spread. With driving race cars no longer possible, Casey turned his attention toward his faith and working with Motor Racing Outreach, a motorsports ministry. At age 21 his courageous 24-month fight came to an end on January 14, 1996, 47 days after his cousin Chase Elliott was born. Chase has often been told about Casey’s positive personality and his gifted ability as a race car driver. “I don’t know a ton about him,” Chase said. “I was born at the end of ’95, and then he died right there at the beginning of ’96. I don’t remember him by any stretch. I definitely have heard a lot of great stories and have always been appreciative of the kind of person and the reputation that he left with. Bill often thinks of his nephew and reminds his son how quickly life can change. “Having Chase racing reminds us all of Casey,” Bill told USA Today in April of 2014. “We all had high hopes for Casey, and then everything changed almost overnight. It was tough for everybody. Kent Waters, a close friend of Casey during their teenage years, defines him as a fun-loving, yet serious competitor. “We went to the same school and met in the fourth or fifth grade,” Waters said. “We started out when we were young and actually met through his grandmother. When we raced go-karts we were together all the time. Casey was very easy going and very smart. We were both practical jokers and had fun growing up together. He was that kind of guy. Longtime residents of Dawsonville remember their young fallen hero and friend as a genuine, highly-respected member of the Elliott family. See Casey’s career racing stats at racing-reference.info. DAWSONVILLE, Ga. — Casey Elliott was expected to be the driver that Chase Elliott has become, and that is a bittersweet reality for the extended Elliott family. Casey was the son of Ernie Elliott, Bill’s brother and the engine expert who provided the power at the center of the family team’s NASCAR success in the 1980s. Casey started racing as a teenager and was two races into what was expected to be a productive career in NASCAR’s Busch (now Nationwide) Series in December 1993 when a growth on his right thigh was determined to be malignant. The cancer spread, and the focus of the family quickly turned from building a racing foundation for Casey, who was only 19 when the cancer was diagnosed, to helping him fight for his life. After a difficult two years, Casey died Jan. 14, 1996, two months after Chase was born. Casey was 21. “Having Chase racing reminds us all of Casey,” says Bill Elliott. “We all had high hopes for Casey, and then everything changed almost overnight. It was tough for everybody. This year, Chase Elliott is performing past all expectations in his rookie season. The Elliott family dynasty will likely continue for some time. Tragically, there is a driver from that family who has been mostly forgotten to the sport. 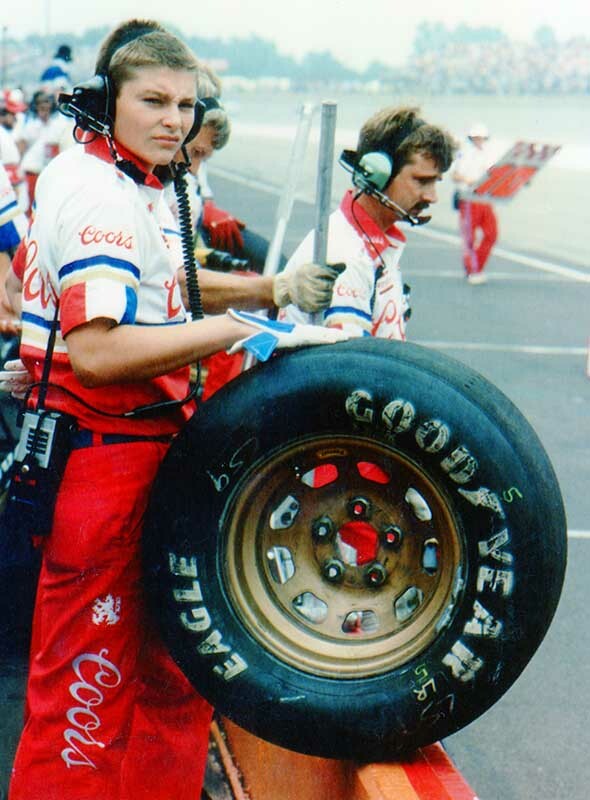 It’s a shame to think that most Chase Elliott fans have never heard of his predecessor and cousin, Casey Elliott. Those who have perhaps only know the basics of his story. The accolades that Chase recieves were all meant for someone else, twenty years ago. Casey’s career and life were a tragic tale of talent denied and unfulfilled optimism, one that should be fully understood. 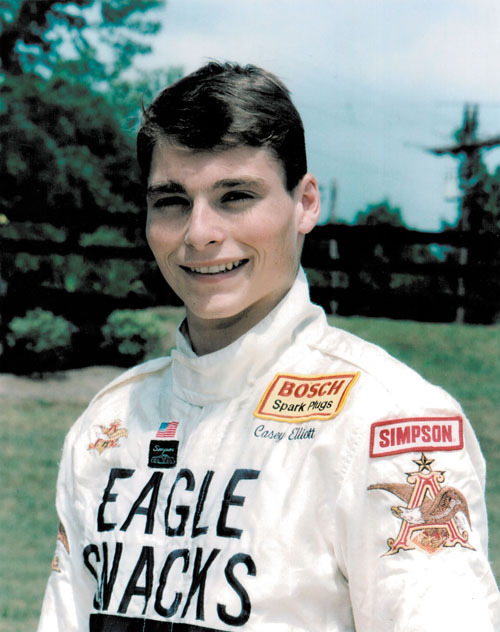 Casey Elliott was born on February 13, 1974, the son of Dawsonville’s Ernie Elliott. Ernie and his brother Bill Elliott were racers and just about to break into NASCAR. Two years later, Bill and Ernie made their first start in the Cup Series and gradually climbed to the top of the sport. Casey’s birthday was always during Speedweeks while his family was racing. Four days after his eleventh birthday, Ernie and Uncle Bill won the Daytona 500 for the first time in 1985. By the time he was mature, Casey entered the family business for himself, a driver with mechanical know how. Read full story at racing-reference.info.